Did you know the average family has 1.8 kids? What do you do with the extra .8? Thanksgiving and the winter holidays are upon us. Even if you normally play with 2 or 3 players, you’ll probably want to accommodate more family in your games! Last week, we released our holiday gift guide. Untold – Anitra and Asher sat down and created a world called “Inventor City”. The scaffolding offered by Untold helped them to tell an interesting story (well, interesting for a seven-year-old), and they’re hoping to revisit it soon. Catch! – from Peaceable Kingdom. We’re really enjoying this elegantly simple co-op. Expect a SNAP review this week. Knot Dice (our review) – Didn’t play quite as much of this as we’d like; Anitra shares a true confession. Mice & Mystics – from Plaid Hat Games. We love (or want to love) this role-playing / combat game. We’ve been playing it every once in a while for the past two years. The mechanics still feel a little too heavy for our kids, and the games tend to run long. Fight for Olympus (our review) – a fantastically balanced two-player game. Every card can be used in multiple ways with wildly different effects. Asher tried it and did OK but it was just a little too complex. Rocky Road A La Mode – Another game with multi-functional cards, also from Green Couch Games. We tried this for the first time with Asher. It’s super-cute and we can’t wait to play again. Adventure Land – not a typical HABA game. We picked this one up on a whim at Barnes & Noble a while ago, and finally tried it this past week (twice!). Each person gets 8-10 adventurer meeples. Every turn, you can move a meeple as far as you want, but only “east” and “south”, never backtracking. Pick up different types of randomly placed tokens, fight monsters, and accumulate points (depending on the scenario). When you run out of “swords” and “companions”, the game ends. Zitternix – a favorite dexterity game from HABA. And now for a quick digression… Hamilton! Andrew’s mom loves entering contests, and entered a contest on LuckySeat.com… She won the right to buy two tickets to Hamilton for $10 each! Anitra got to go with “mom” and they had a great time. Century: Golem Edition – because we love it. Beyond Baker Street – 2-4 detectives cooperate to solve a crime faster than Sherlock Holmes. “A cross between Hanabi and Spy Club.” While holding your hand outwards, play cards to solve 3 aspects of the crime. Sherlock Holmes gets closer to solving the crime every time you share information about someone’s cards. But there’s also a special discard pile called “the Impossible”, that must reach a value of exactly 20. If it’s under 20 when you solve the crime, you lose. If it goes over 20, you lose. Andrew and Anitra have both been playing a lot of Spider-Man on the PS4. We really like it. Newsletter response: A very nice email from listener Gordon. 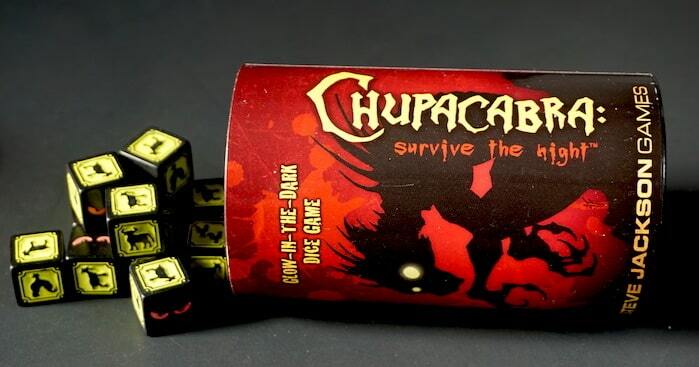 Anitra reviews Chupacabra: Survive the Night, a simple dice-stealing game with glow-in-the-dark dice! Because sometimes you want to play a game with more than four people. 5. Ticket to Ride – the classic gateway game. There are tons of options, and many of them support 5 players. 4. Spaceteam – loud, ridiculous, and fast-paced, this cooperative game always leaves us laughing and our adrenaline pumping. 3. Magic Maze – although not everyone likes it, this game scales incredibly well from 1-8 players. Anitra says 5 players is the weakest player count for Magic Maze, though. 1. Deep Sea Adventure – ever since Ryan Gutowski mentioned it to us, it’s been high on our list. Flexible, easy to teach, compact, and we love the way everyone depends on each other, even though it’s a competitive game. 5. Happy Little Accidents – a fun way to sit down with 5-6 people for 20 minutes and doesn’t require any particular skill. 3. Century (Golem or Spice Road) – again. Surprise! 2. Tokaido – a great way to calm down after playing some of the more frantic games on our lists. Turns don’t go in order, they instead favor the player last in line, which is a great equalizer. It plays just as well at 4 and 5 players as it does at 2 or 3. 1. Go Nuts for Donuts – a favorite in our family, since even the 4-year-old can play. We work on pattern recognition and secret voting. A game where everyone ends up laughing as we all vote for the same donut and are all denied. PLEASE don’t forget to subscribe to the show, tell your friends about the show, and leave us a review at Apple Podcast or whatever your podcast subscription source is. We’re also on TuneIn.com. Disappointed that this list starts off with a game that is only for 4 players (at least according to every link I have looked at for it). Sorry about that. Since this is from our podcast, we always spend the first half talking about what we’ve been playing, even if that doesn’t fit with the theme of the show.